A BEAST of a B-17! This monster B-17 is the handiwork of Peter Pfeffer of Austria and just completed its first flight. The 19-foot-span bomber is powered by four Armin DeVries 42cc gas 4-strokes and controlled by a Weatronic radio. It weighs in at 187 pounds. Our thanks to RCScaleAirplanes for posting this impressive video on YouTube. For photos of the build, check out Peter’s Flicker account here. He notes that he still needs to add nose art and scale details before this bird is ready for the summer show circuit; we can’t wait to see it all dressed up! Great video. European pilots sure love their big aircraft. I think a 1/2 scale B-17 would be even better…………..
I’m gonna quit complaining about our field and obstacles in general — his field is narrow, lots of airplane-grabbin’ trees, and those high-lines on the far end !!! I Think I would have driven a hundred miles to find a little more open spot to maiden that thing ! Spose he could “air-start” that dead #3 if he climbed it a couple thousand feet and dove it like Yuri Higuchi does in his demo ? !!! Like I say – Impressive ! AMAZING , still flew well with one motor out too.. I am sure he was glad to have that first flite over..thanks for sharing! It’s a party! No one ever brought me a beer after a maiden. Here in the U.S. some grumpy old guy with patches on his vest would have asked to see my “AMA” card, incorrectly told me how many rule violations I committed, and told me my engines were to loud after a flight like this. Lol. Great work guys. Its nice to see people having so much fun flying RC planes. Beautiful airplane. Beautifully flown. Aldo: Really a monster. The take off was as the actual bomber, not like a model. Thanks . I agree with all of you, this is a great video of a Fantastic aircraft. We can all learn Something from the great camaraderie this club has for each other. Super Nice!, I am thinking in build one little bit smaller 207″ WS do you know how I can contact this excellent builder in order to get the plans? I hope this huge monster with gallons of gas never crashes into my house. Where is reason? This large of an un piloted aircraft is just the reason that the FAA is going to eventually shut down radio control modelers. Why does not this idiot who built this abbreviation learn to fly a real airplane and build accordingly. Why is he determined to ruin the hobby for the rest of us. I am a “Master Pilot” , Designated Pilot Examine with over twenty one thousand hours as an instructor and Pilot Examiner. I have b een flying for over fifty years without an accident and here comes this moron with his monster airplane that scares the hell out of me. Please do the hobby a favor and do not encourage this group of monster airplanes that can do monster damage. If they had any guts they would build experimental aircraft that will carry them aloft if they have the courage to take real flying lessons and become a real pilot. Please do the hobby a favor yourself and QUIT, lol! And we are SO impressed with your ‘credentials’ (do you wear little patches proclaiming your glory? ), sheesh…what a maroon, as Bugs Bunny would say. For those of you wussies complaining about large aircraft and the “inherent danger”, do you really think smaller aircraft are any safer? I’ve been flying for over 40 years, everything from the old Cox control line planes to turbines, and have seen more than enough incidences to tell you all to bugger off, as ANY model plane is “inherently dangerous” under the right circumstances. As MOST others have said, congratulation to this guy and his building and flying skills, and yes…the genuine camaraderie of the club members and others at that field are something that is becoming more and more scarce at far too many fields and events here at home. If all you know about the airplane is what you saw in the video, then you really don’t know much about it, do you? Which means you’re just an opinion walking around with no facts behind it and so you’re scared. Boo hoo. You are an absolutely counter intuitive, ego filled, donkey of a man! You give pilots a bad rep. I don’t care how many hours you have… Aviation is for everyone and how they realize their own dreams is their perogotive. That’s the spirit and magic of ALL aviation. Take your pompass remarks somewhere else. Apparently having 20,000 hrs makes you a bitter old man. Congrats to ALL who venture and dream of flight! AND IF THEY CAN’T GET A PILOT’S LICENSE TO FLY REAL AIRCRAFT, GO FLY AN ULTRALIGHT. 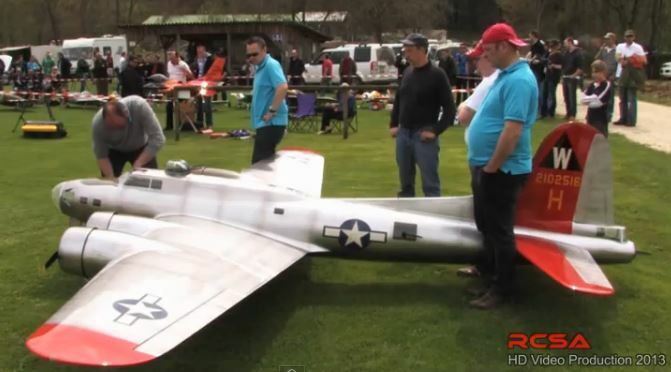 RC PLANES THIS BIG ARE GOING TO BE THE END OF OUR HOBBY BY THE FAA. ONE CRASH INTO A HOUSE OR A CAR OR HEAVEN FORBID, A REAL AIRCRAFT,,, AND WE WILL ALL SUFFER. TEN FEET WINGSPANS ARE BIG ENOUGH ALREADY!! Wilbur and Orville would be impressed! Before computers that’s how they made sure it would work by using a wind tunnel. Model building is becoming a thing of the past. Thank goodness for guys like these. Haben sie ein gut bier? :)Das ist eine wunderbar model, sehr gut! Great!) Pleas do your best.. for I love this sport too. How to buddy box a Spectrum DX8 to a DX5.. Please if you can ….step by step instructions. Wow. This is what the CIA and FBI should be using as drones…they’d be seen, but it would lend a nostalgic mood to the situation! On #3 engine out landing…I halfway expected to see red flares shooting out of the radio compartment hatch! !